The ROCK hits the FAN TOMORROW NIGHT, November 19th at Mt Barrels in Schaumburg, IL. Michael Weber, and Jeff Millar-Sax. More to be added!!! Cover Charge is $10 at the door! Each year, in celebration of Art Basel Miami Beach, the Patricia and Phillip Frost Art Museum at Florida International University hosts Breakfast in the Park (an official Art Basel Miami Beach event). Celebrating its 13th year, this event is free and open to the public and draws hundreds of art enthusiasts, patrons, collectors, gallery owners and artists from around the world, many visiting Miami for Art Basel. A noted sculptor is invited to speak every year, this year's guest lecturer is the artist Judy Pfaff. Judy Pfaff is pioneer of installation art. Her vibrant sculptures and sprawling installations carefully piece together plastics, fiberglass and steel, among other materials, to create dynamic environments. She has earned numerous awards including a MacArthur Fellowship, Guggenheim Fellowship, and grants from the National Endowment for the Arts, among many others. More about the artist at judypfaffstudio.com. Guests at Breakfast in the Park enjoy a complimentary outdoor breakfast, informal lecture and guided tours of the university's Sculpture Park. Visitors also enjoy the exhibitions on view for the museum's Art Basel season - Narciso Rodriguez: An Exercise in Minimalism; Drawing Line into Form: Works on Paper by Sculptors from the Collection of BNY Mellon; Pierce, Mark, Morph; and Yuni Kim Lang: Comfort Hair. While this event is free and open to the public every year, guests are encouraged to RSVP in advance as space is limited. RSVP at this link. Presented in partnership with West Kendall Baptist Hospital. “As audiences from all over the world converge upon Miami for Art Basel season, the new lineup of exhibitions and events at the Patricia & Phillip Frost Art Museum FIU is a reflection of our interest in art globally: from New York to South America, from Cuba to Korea, and beyond. We're thrilled to present Judy Pfaff as our guest lecturer this year for Breakfast in the Park," said Dr. Jordana Pomeroy, the museum’s Director. Judy Pfaff was born in London, England, in 1946. She received a BFA from Washington University, Saint Louis (1971), and an MFA from Yale University (1973). Recipient, Academy Member Fellowship, American Academy of Arts & Sciences (2013); Anonymous Was A Woman Award (2013); MacArthur Fellowship (2004); Guggenheim Fellowship (1983); National Endowment for the Arts grants (1979, 1986); member, American Academy of Arts and Letters. Numerous exhibitions in major galleries, museums and art fairs include: the Biennale de Venezia in Venice, Italy; Whitney Museum of American Art Biennial Exhibition; Hirshorn Museum & Sculpture Garden; The National Museum of Women in the Arts; Holly Solomon Gallery, NY; The Barnes Foundation, Philadelphia; Denver Art Museum; Columbus Museum of Art; Andre Emmerich Gallery, NY; and St. Louis Art Museum, among others. Commissions include Pennsylvania Convention Center Public Arts Projects, Philadelphia; large-scale site-specific sculpture, GTE Corporation, Irving, Texas; installation: vernacular abstraction, Wacoal, Tokyo, Japan; and set design, Brooklyn Academy of Music. Pfaff's work is featured in numerous permanent collections, including: the Museum of Modern Art; Whitney Museum of American Art; Brooklyn Museum of Art; Detroit Institute of Arts, and more. She is a Milton Avery Distinguished Professor of Art, at Bard College (1989, 1991). Click on this link or on the map images below to view the Sculpture Park brochure online. Check Out the 14th Annual Chicago Toy & Game Fair this Weekend! Saturday, November 19, and Sunday, November 20, at Navy Pier! Come and play at Chicago Toy & Game Fair, the largest non-hobby toy and game fair open to the public in the USA! There's something for the entire family - from tots, to adults, to grandparents. Looking for something a little different? Attend the PlayChic Fashion Show on Friday, November 18, and witness today's most innovative game and toy designs come alive on the runway! Buy before 10am tomorrow and save 50%! 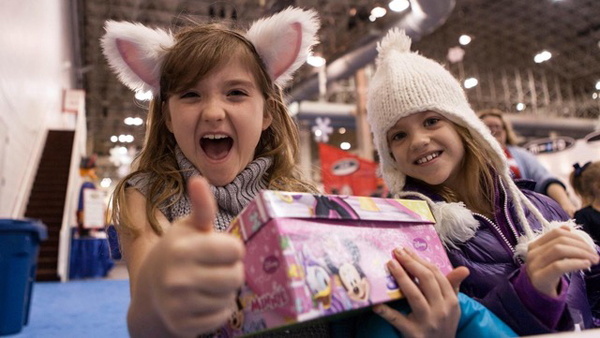 Hundreds of #toy & #game exhibitors and interactive exhibits! Walk inside the WORLD's LARGEST pom pom by Pom Pom Wow. Inventor Meet and Greet throughout both days!! Want to meet the inventor of bop it!, Operation? Jenga? Nerf? And #Twister? The Young Tech Challenge sponsored by Spin Master! More fabulous toys and games by PlayMonster Fun! Test drive the hottest new rides from Razor Worldwide! Celebrate UncleMilton 's 60th Ant-iversary Ant Farm! Witness the great Illinois State Yoyo Contest! The Mommy and Gracie Show (aka The Gracie and Mommy Show) unboxing! Super Power Sensory Hour 9:00 am – 10:00 am hosted by National Lekotek Center providing early access to families of children with special needs! Climb inside a REAL OREGON TRAIL covered wagon by Goliath Games LLC! For more details and tickets, visit chitag.com! Also this Weekend, the Magnificent Mile Lights Festival Celebrates 25 Years! For the first time ever, the festivities start on Friday, November 18, at Lights Festival Lane in Pioneer Court. Get a taste of Chicago with Connie's signature deep dish pizza, take a picture with the family in the Disney Store's wintery wonderland, learn about "Christmas Around the World" with the Museum of Science and Industry and much more! Click here for a full list of activities! On Saturday, November 19, The BMO Harris Bank Magnificent Mile Lights Festival will once again offer a full lineup of activities, starting at 11:00 AM and continuing throughout the evening. 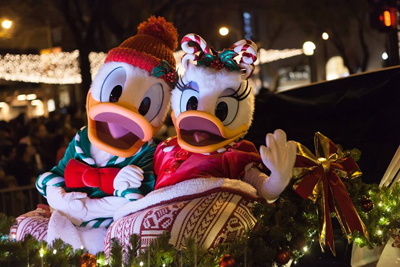 A grand Tree-Lighting Parade down Michigan Avenue marshaled by Mickey Mouse and Minnie Mouse from Walt Disney World Resort in Florida steps off at 5:30PM. For all the information you need to participate, check out the 2016 Activity Guide! Michigan Ave. and Washington St.
For complete details on the Christmas Tree Lighting Ceremony and all FREE holiday programming presented by the Department of Cultural Affairs and Special Events, visit cityofchicago.org/holiday. Nando's PERi-PERi, the South African-Portuguese restaurant known worldwide for its spicy flame-grilled chicken, celebrates its grand opening in Oak Brook this Sunday, November 20. The restaurant, at 523 Oakbrook Center in Oakbrook Center Mall, is the tenth Nando's location to open in the Chicagoland area. Nando's will pay it forward by donating 100 percent of sales to support student programs at Hinsdale Central High School. Opening-day sales will be donated to Hinsdale's performing arts program. Nationwide, Nando's has donated more than $200,000 to local non-profit organizations, all through opening-day sales. Last weekend, Nando's opened its first Skokie location, in the Westfield Old Orchard mall. Nando's next Chicagoland restaurant is set to open in mid-January 2017 in the Hyde Park neighborhood, at 1447 E. 53rd Street near the University of Chicago. "As newcomers to the Oak Brook area, we wanted to be good neighbors and help raise funds for Hinsdale Central High School," said Burton Heiss, CEO of Nando's PERi-PERi USA. "We can't wait to fire up our grills at our tenth Chicagoland location." Nando's new Oakbrook location at Oakbrook Center mall. WHEN: GRAND OPENING IS SUN. NOV. 20 AT 11am CT. THE HINSDALE CENTRAL HIGH SCHOOL FUNDRAISER RUNS FROM 11am to 9pm. Nando's PERi-PERi made its U.S. debut in 2008 with the opening of its first location in Washington, DC. Nando's PERi-PERi now operates more than three dozen restaurants in and around Washington, DC, Baltimore and Chicago. For more information, please visit www.nandosperiperi.com, follow @NandosUSA on Twitter or Like Us at Nando's PERi-PERi USA on Facebook. Erwin Olaf was the 2008 Lucie Honoree for his Achievement in Advertising Photography. "Hope, Portrait #5, 2005" and "Hope, The Boxing School, 2005" are two poster editions designed with Erwin's photographs and now available in the Lucie Editions collection. Presented by the Lucie Foundation, Lucie Editions are limited edition, signed posters by master photographers recognized at The Lucie Awards. These Lucie Honorees represent some of the most important photographers of the 21st century. Melvin Sokolsky, David Hume Kennerly, Barton Silverman, Jerry Uelsmann, John Biever, Phil Borges, Bob Willoughby, Nancy McGirr, Reza, Steve McCurry, Kenro Izu, Gene Trindl, Pedro Meyer, Lee Tanner, Douglas Kirkland, Antonin Kratochvil, and Marvin E. Newman.